Perhaps I need to send these along with my C.V. to everyplace I have been applying. 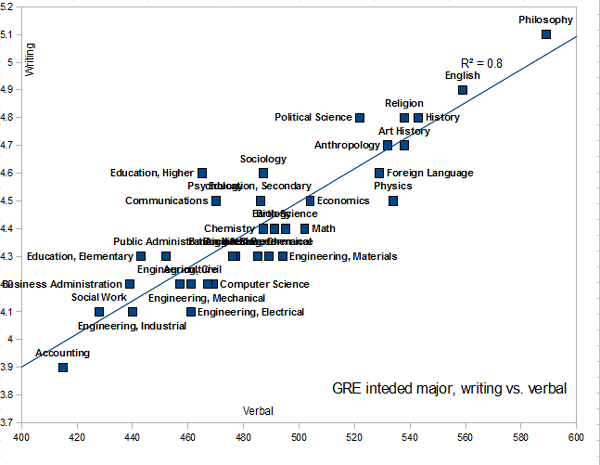 And attach my GRE scores (which place me above the average philosophy student in both math and verbal). Because the C.V. alone isn't doing it. At all. Nothing since graduating in 2004. Nice to know. Changed from Computer Science, to PC Tech, and thinking bout going the philosophy route at University. 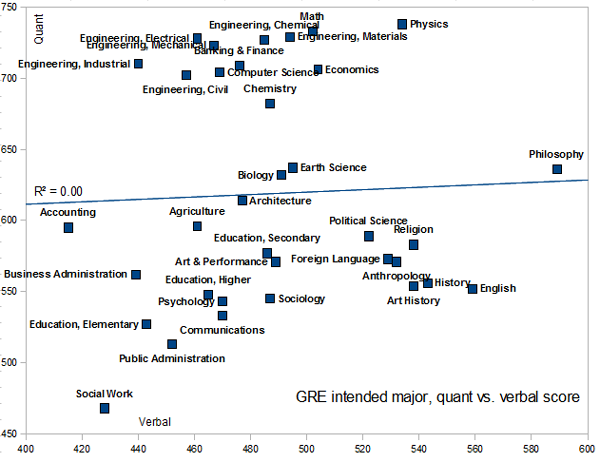 What types of jobs do philosophy majors end up with, anyways, other than teaching and writing? 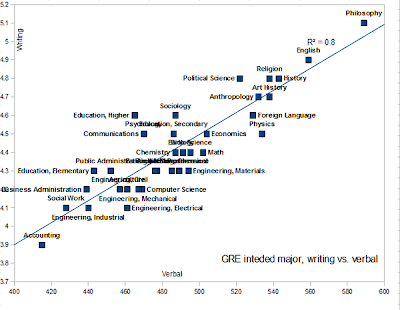 The GRE is an entrance exam for graduate school. Of course more competetive programs will require higher scores. 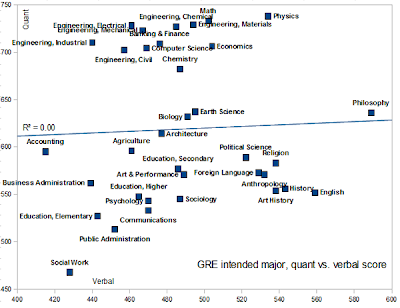 I think the demand for business degrees, as well as universities being less stringent on admission for them, is reflected in this graph. Perhaps people who want nothing more to do than think all day with their infinite wisdom choose to study Philosophy. Troy is right, no-one even know what Philosopy is so it is immediately discounted, as if you had done nothing at all for 3 years. My current recruitment consultant has recently erased all trace of it on the CVs he sends on my behalf. Swenka you should try to do some programming as well you will walk straight into a job. In the United States, an undergraduate degree in Philosophy, accompanied by other courses in mathematics and the sciences, provides an excellent basis for further graduate education in fields like Medicine, Law, and Business. There is a false belief that Medical School, Law School, and Business School admissions criteria require undergraduate majors in so-called "Pre-Med", "Pre-Law" or Business. Frankly, it is probably more difficult to actually major in Philosophy and take the prerequisites for these professional schools than to narrowly focus on one of the sciences or other fields often thought to be required for graduate admission. A self-imposed and immutable law of said discipline, is that cause precedes effect. The inconvenient paradox of the Big Bang, is the existence of effect sans cause. Will no one rid us of ever-troublesome reality? It takes at maximum, three elementary questions to reduce all human understandings to dust. But to be charitable, humans are by their very nature inherently flawed. Therefore, all understandings devised by humans cannot but be similarly marred. Future world is best suitable for management guys, so I think it is highly recommended to take up Business degrees beforehand. Anonymous: How much psilocybin have you ingested? What are you talking about? I am considered an oddity: a literate engineer. Guy: You are in good company! I believe that Wittgenstein was a literate engineer! The world needs people like you! Computer is an electronics device that can accept data and instructions as input, process the data to given instructions and shows results as output. Computer also has ability to store data and instructions. The physical and tangible parts of the computer are called “Hardware”. “Software’s” are intangible parts of the computer system. This article focuses on what a learner should take into consideration when choosing the right accelerated online degree program. Some very useful tips are written to make it easier for an online learner to make a decision. Visit our website for the details.